As the largest and most developed island in the Seychelles archipelago, Mahe is not only the gateway to this tropical paradise but is also home to the Seychelles’ capital city Victoria, along with around 90% of the country’s population. But Mahe, named in honour of the 18th century governor of Mauritius, is much more than just a financial and political hub. Dominated by the towering granite peaks of the Morne Seychellois National Park, the lush mountainous landscape of the interior soon drops down to a coastline punctuated with breath-taking bays and sandy coves. From the dense forests and their rare endemic flora to the cerulean waters that surround the island, Mahe Seychelles offers visitors boundless opportunities for adventure or relaxation. The powdery-white sands of Beau Vallon and Anse Royale, along with over 20 other beaches, beckon visitors to lounge under swaying palms, whilst the waters of the Ste. Anne Marine National Park, amongst others, are a scuba diving delight. All this, coupled with a wealth of hiking, surfing, fishing and snorkelling possibilities, means there’s never a shortage of activities to keep you busy. For those seeking something a little less adventurous, Mahe is steeped in history and culture. Stroll through the streets of Victoria with its famous Clock Tower, colonial architecture and colourful market or perhaps pay a visit to the Seychelles National Botanical Gardens, with its wide collection of mature, exotic and endemic plants. For those wishing to delve deeper into the island’s past, the National Museum of History, along with the Natural History Museum, offer great insight into Seychelles culture, traditions and its natural heritage. Mahe is also the main hub for Seychelles Island Hopping and day excursions to the islands of Praslin and La Digue, as well as many of the other smaller islands. Scheduled flights and helicopter transfers depart from Mahe's international airport while the jetty in Victoria’s harbour plays host to the Cat Cocos ferry and other private yacht charters. The majority of Mahe’s accommodation is strung along its stunning coastline, with Beau Vallon in the north-west offering not only a wide variety of hotels and self-catering apartments but also the largest selection of restaurants and nightlife. Dotted along the rest of Mahe's shores you’ll also find numerous luxury resorts ready to pamper to your every beck and call. With its relaxed pace of life and overwhelming natural beauty, every Seychelles itinerary should allow for a few days to explore Mahe. With a good system of well-maintained roads and an extensive bus network, accessing Mahe's fabulous natural attractions is fairly easy; however hiring a car is probably the best way to see what Mahe has to offer, with distances being relatively short and attractions well sign posted. Wherever you go on Mahe, be it on the coast or high up in the mountains, you almost always run the risk of being caught in a tropical downpour. 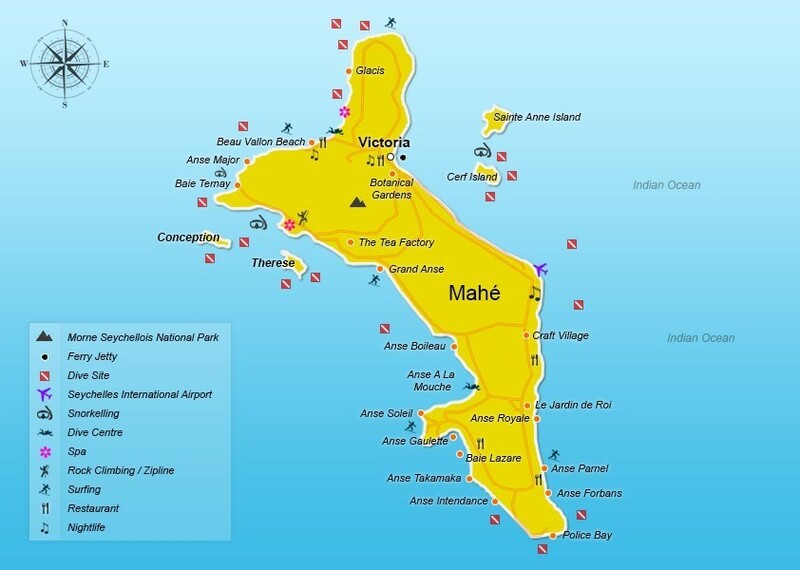 As a result of its rugged topography, Mahe receives more rain than most other islands. However, showers don’t last long and without them Mahe would not be the verdant jewel that it is, in an otherwise sparse ocean! Victoria – Take a day away from the beach to explore the island capital. At its centre you’ll find the Victoria Clock Tower, reminiscent of London’s Big Ben and now a national monument. A visit to the lively and colourful Sir Selwyn-Clarke Market is a great way to experience daily Seychellois life. Get there early to see the stalls of fresh fish, exotic fruits and island spices. Around the market you’ll find boutiques and shops selling a variety of souvenirs, clothing and local art. Victoria is also home to several museums including the National Museum of History and the Natural History Museum. Seychelles National Botanical Gardens – Just on the outskirts of Victoria, in Mount Fleuri, lay the beautifully manicured gardens of one of the Seychelles’ oldest national monuments. The caringly landscaped gardens are home to a wide collection of rare and native plants, such as the famed Coco de Mer palm, as well as a variety of spice and fruit trees. Aside from the flora, you’ll also find giant tortoises, fruit bat colonies and a small cafeteria. Morne Seychellois National Park – Encompassing over 20% of the land area of Mahe, this splendid national park is undeniably one of the island’s highlights. Created back in 1979 the park is made up of a variety of habitats, from the Seychelles’ highest peak – the Morne Seychellois (905m) – through dense forests all the way down to coastal mangroves. A network of 12 well-marked walking trails criss-cross their way through the park, varying in distance and difficulty from 1-2hr walks along the coast to full-day hikes taking in both natural and historical sites along the way. Even if you don’t have time to walk in the park, there’s a stunningly scenic drive from Victoria to Port Glaud, which cuts right through the park. Beau Vallon – The sweeping bay of Beau Vallon is home to one of Mahe's most popular beaches. Stretching almost 2km from Bel Ombre to Mare Anglaise on Mahe's north-west coast, the golden sands of this takamaka-lined beach are a favourite with locals and tourists alike. The sparkling waters of Beau Vallon are ideal for swimming and other aquatic activities, while the off-shore coral reefs offer countless possibilities for scuba diving, with several dive centres located in Beau Vallon. Behind the beach you’ll find a good number of hotels, restaurants and bars. It’s also the site of a long-established bazaar, where stalls sell a variety of tasty street food snacks and assorted souvenirs every Wednesday and Saturday evening. Craft Village (Domaine de Val des Près) – Showcasing several aspects of traditional Creole culture, this colonial homestead highlights local architecture, arts & crafts and gastronomy. Explore the collection of buildings that include the 19th century plantation house Grann Kaz, featuring examples of colonial period furniture and artefacts, as well as the Maison de Coco – a house built almost entirely from coconut palms. In the brightly painted cottages surrounding the main buildings, local artisans display their handicrafts. Ste. Anne National Marine Park – Lying about 5 kilometres off Mahe's northeast coast, this collection of six small islands and their surrounding waters make-up one of the Seychelles’ most popular natural destinations. Glass-bottom boats will transport you in about 20 minutes from Victoria to the crystal clear waters of the marine park, where colourful corals and reef fish abound. The waters here are ideal for snorkelling and with one of the largest areas of sea grass in the archipelago, there’s a good chance you’ll encounter hawksbill and green sea turtles; dolphins are often spotted too! With its powder white sand beaches and dense tropical vegetation, Ste. Anne Island itself was the location of the Seychelles’ first settlement over 240 years ago, which later became a whaling station and eventually gave way to a naval base in WWII. For those wishing to stay longer than just a day trip, there’s accommodation and restaurants available. There are also places to eat on neighbouring Cerf and Moyenne islands, the latter of which is alleged to hold buried treasure! Being a national park, visitors will need to ensure they purchase an entry permit in Victoria before arrival. Le Jardin Du Roi Spice Garden – Originally created by French settlers to grow spices, this renovated plantation now boasts rows of vanilla vines, cinnamon, nutmeg, pepper plants and many other spices. From its hilltop location above Anse Royale this pleasant park is also home to various medicinal plants, fruits and other endemic flora. Take a leisurely tour of the garden (maps available on site) followed by a refreshing drink or snack at their open-air restaurant. Spices, scented candles and other assorted souvenirs are available for purchase from their Spice Shop. Head to the beach - One of the main reasons visitors head to the Seychelles is for its beaches, and on Mahe there’s definitely a beach to suit everyone. Mahe proudly boasts some spectacular beaches dotted around its rugged coastline, from surf beaches like Anse Intendance and Anse Parnel to the calmer waters of Anse à la Mouche and Anse Soleil which are ideal for swimming. Pack your swim clothing and some snacks and you'll be sure to have a great time on the stunning Mahe beaches. And if the popular beaches of Beau Vallon and Anse Royale seem too busy, then you can always get away from it all at Anse Forbans, Anse Major or one of the many other smaller, secluded beaches. If you're lucky, you might have the beach all to yourself! Spot a spotty whale ...... shark - Measuring up to 18 metres in length, the Whale Shark - with its distinctive spotted skin - is the biggest fish in the sea! From August to the end of October, sea conditions permitting, you can join the monitoring activities of the Marine Conservation Society Seychelles and experience first-hand what it’s like to encounter one of these majestic animals. Micro-lights are used to spot the sharks from the air and then, using high-speed catamarans, you’ll be whisked out to their location. Groups of up to a maximum of 8 people at a time are then given the privileged opportunity to snorkel / free dive with these gentle giants, with all activities being run in strict accordance to the Seychelles Whale Shark Encounter Code of Conduct. Whale Shark experiences are offered by the leading dive operators with over half the cost of your trip going directly to support on-going MCSS projects. Scuba Diving - With over 30 dive sites around Mahe alone, there’s never a shortage of diving possibilities in the clear blue waters surrounding the inner islands of the Seychelles. An assortment of underwater seascapes, from characteristic granite boulders to shallow banks and reefs, provides a home to a myriad of fish species and other marine life. Giant sea fans and colourful hard and soft corals can be seen growing on the boulders while, depending on the season, whale sharks and manta rays can be encountered as they sift the ocean for its plankton rich treasure. Year-round however, there’s always plenty to see for the experienced diver, with large schools of snappers, fusiliers and jack fish keeping the reefs sharks and mobula rays company. For the uninitiated, the island’s dive operators offer all levels of courses from half-day dives of discovery to complete certification programs. Dive sites to look out for include Shark Bank, Brissare Rocks, L’Ilot and the well-known Ennerdale wreck – a British Fleet Auxiliary tanker which sunk in 1970. Surf’s Up - Although not topping the list of world surf destinations, Seychelles surfing is slowly starting to hit the map. The warm waters of the Indian Ocean, coupled with some stunning coastal scenery, offers surfers of all abilities the chance to have some fun in the relatively undiscovered waves that break along Mahe's coastline. Around the island, you’ll find both left and right beach breaks, multiple coral breaks and the odd point-break too. Beginners should consider the soft sandy bottom of Beau Vallon whilst Grand Anse is hailed as probably the best and most consistent overall surf-spot. Other popular spots include Anse Soleil and Anse Gaulette, while for the more experienced, the reef breaks at Anse Bourgainville and Anse Poules Bleues will more than keep you challenged. Always check with the locals for current conditions, as the best places to surf will vary with the changing monsoon climate. Sail into the sunset - There’s probably no better way to appreciate the diversity and breath-taking natural beauty of the Seychelles than aboard your own vessel, under power of sail. With 115 islands, spread over 1.4 million square kilometres of azure ocean, there’s far too much to explore for the average holidaymaker. But you can still experience the feeling of life on the ocean wave by hiring your own sailboat from one of Mahe’s many charter operators. Choose from simple day charters around the main inner islands to fully-crewed long range charters to the outer-lying islands of this pristine archipelago. Operators also provide diving and snorkelling opportunities, as well as private and group sunset cruises that depart from Beau Vallon and Bel Ombre. Swing from the treetops - For a great day out with the kids and for anyone with a head for heights, SMAC Adventures offers an exhilarating experience for all the family. Located within the Constance Ephelia resort, this professionally run adventure organisation has created an exciting series of aerial ziplines that will have you flying through the trees like Tarzan in no time. With breathtaking views of Port Launay your experienced guides will help you tackle adrenalin-pumping rides like “The Icebreaker” while always ensuring your safety and providing all the necessary safety equipment and instructions. Young and old alike are sure to have a fantastic time with rock climbing and abseiling completing a day of adventure. Fancy a cuppa? Discover first-hand how Seychelles tea is grown and produced at The Tea Factory. Take a guided tour through the stunningly scenic terraces of tea plants at Morne Blanc, where you’ll get to see how the leaves are picked, blended, processed and packaged to produce an array of tea products. Tastings and purchases are possible at the Tea Tavern located next to the factory. WhatsSUP? - Yes, the Stand Up Paddle-boarding phenomenon has now hit Seychelles’ shores. Join the guys from iSurf Seychelles who offer (beginners) lessons as well as guided SUP tours around some of Seychelles most breath-taking paddling locations and beaches. Based at the Kempinski Resort, their qualified instructors will teach you all you need to know to have you paddling across Seychelles’ turquoise waters in no time. Snorkelling - The Seychelles offers some fantastic snorkelling opportunities, with Mahe having its fair share of great snorkelling spots. For some of the best snorkelling, head to one of the National Marine Parks – Ste. Anne or Port Launay. Snorkelling around the tiny island of Moyenne in the Ste. Anne park is an unforgettable experience, whilst in the Port Launay park the reefs on both sides of Baie Ternay provide some wonderful snorkelling opportunities. Outside of the parks, which levy an entrance fee for all non-residents, you’ll found some other great snorkelling spots at Anse Major, Petite Anse, Anse Diri in Bel Ombre and in Glacis between the Hilton Northolme and the Sunset Beach hotels. Masks and fins are available to rent from some of the dive operators but best is to bring your own equipment from home. Pilot an F16! - Ever thought what it would be like to sit in the cockpit of an F16? The people at Buggy & Jeep can make your dream come true….well almost. The F16 in question is the SECMA F16 Roadster, a light-weight racing car with the reliability of an everyday road vehicle. This, along with a number of other specialty vehicles, is now available for rent on Mahe. Whether winding your way through Mahe’s Morne Seychellois mountain roads or cruising along its beaches, being behind the steering wheel of one of these vehicles is an incredible experience – a must do activity for any auto enthusiast visiting Seychelles. There’s a couple of F16’s as well as traditional Beach Buggies and a Copen Roadster. Anyone can hire a car to see Mahe's highlights, but are you game to try something a little bit different, not to mention the heads you'll turn as you cruise your way around paradise! Fishy, Fishy, Fishy - Want to discover Seychelles’ underwater world without getting your feet wet? Then a visit to the Eden Aquarium is the ideal way to see what lies beneath the waves. With around 33 tanks, the recently opened aquarium – situated in the Eden Island mall – gives guided tours to visitors of all ages, allowing you to see close-up the incredible variety of local fish species that inhabit the waters throughout the Seychelles archipelago. But it’s not just about the fish. The themed tanks are also home to an extraordinary array of other sea creatures, including anemones, eels, starfish and even an octopus. There’s also a gift shop offering fun sea-themed toys for the kids and t-shirts with beautifully designed marine art. A great family activity! With its blend of European, Oriental and Asiatic flavours the Seychelles kitchen is a glorious fusion of spices and local ingredients, caringly prepared to create both traditional and modern Creole fare. Mahe has a wealth of restaurants offering diners not only the chance to experience this unique cuisine but also caters for a broad variety of international palettes. Choose from fine-dining with a beach view to a wood-fired pizza in the heart of town and everything in between. Next to the regular restaurant experience, there are also traditional bazaars, where stall owners freshly prepare a variety of inexpensive street food delicacies for the passing crowds. Marie Antoinette – For a full-on authentic Cajan/Creole experience, this historic hillside restaurant just outside Victoria is well worth a visit. Their time-honoured set menu has remained virtually unchanged since opening over 50 years ago and features traditional Seychellois cuisine. Housed in a colonial mansion, now a national monument, you’ll feast on everything from aubergine fritters and chicken curries to tuna steaks and battered parrotfish. Along with a selection of salads and sides, there are also local desserts and sorbets. This place will give you a real insight into the authenthic way of life on the island and the only thing you have to do is remember to bring your appetite! La Plage Restaurant – As the name suggests, this stylish restaurant is located right on the beach and overlooks the calm waters of Beau Vallon. Their innovative menu veers away from the usual Creole fair and offers diners a more sophisticated brasserie-style experience, which draws on international flavours to create an unforgettable fine-dining experience - Lovely views, great food and outstanding service. Pirates Arms – Right in the heart of Victoria is probably the most popular meeting places for locals and tourist alike. Grab a cold beer and watch the world go by for a few hours or maybe sample some of their reasonably priced dishes such as Fish Creole, a house speciality. There’s often live entertainment on the weekends and a separate games room with slot machines. La Plaine St. André – Somewhat more upmarket is La Grand Maison restaurant at the famed Takamaka Bay Rum distillery. Located in a lovingly restored colonial house, Christelle Verheyden - one of the country's most talented chefs - offers contemporary remakes of traditional dishes as well as some true and tested international favourites, ensuring there’s something to satisfy even the most discerning of palates. A good selection of wines and cocktails, complimented by the romantic setting, makes this an ideal venue for a special evening. Surfers Beach Restaurant – Positioned only metres from the clear waters and sandy shores of Anse Parnel, this relaxed beach-side eatery is where surfers and beach-going tourists head to for a tasty snack. Serving a range of international and Creole cuisine, it’s the perfect spot for a refreshing drink or quick lunch while watching the waves break. La Perle Noir – Another notable option in Beau Vallon, this pleasant restaurant offers a mix of Italian, International and Creole cuisine. Whether you choose to sit outside on the veranda, overlooking the tropical garden, or in the air-conditioned inside space, their friendly service and choice of specialities will have you coming back time after time - Bookings essential. Sam’s Pizzeria – Just a few metres south of the Clock Tower in Victoria you’ll find some of the best wood-fired oven pizzas in the Seychelles - Friendly service and reasonable prices. Double-Click Cafe – Freshly made sandwiches, homemade cakes and pastries and great coffee are what you'll find in this Victoria (Internet) cafe. They also have some of the best money exchange rates on the island! The Maharajas – For probably the best Indian food in Seychelles, look no further than this elegant restaurant situated by the marina on Eden Island. Their choice of appetizing dishes embody the essence of North Indian cuisine, with a menu of popular curries, tandoori specialities and delicately spiced signature dishes that are bound to satisfy even the most discerning of Indian food lovers. Delplace Bar & Restaurant – From its beachside location at Port Glaud, a visit to this trendy chic restaurant is a must when visiting Mahe's north-west coast. Renowned for its fresh fish and seafood platters it's the perfect spot to enjoy a relaxed lunch, with views across the lagoon, or a romantic dinner as the sun sets behind Isle Therese. The ambience is laid back, the cocktail delicious and the view is arguably one of the best from any Mahe restaurant. Maria’s Rock Café – If you’re a fan of DIY then why not head down to Baie Lazare and try out the ‘hot rock’ barbecue. This quirky place offers guests the chance to cook their own meat, fish or seafood on hot stones. The drinks are cheap, the service super friendly and although access may be a little tricky in the dark, it is well worth a visit - Definitely an experience. Boat House – Popular with locals and tourists alike, this spacious but cosy restaurant is famed for their scrumptious all-you-can-eat buffet dinners. Open 7 days a week and located only a few steps away from Beau Vallon beach, they offer over 20 mouth-watering dishes that include all the usual Creole standards along with fresh salads and grilled fish - Great value for groups and families. Being the biggest and most populated island of the Seychelles, Mahe is where most of the action is after dark. And although most hotels and resorts have their own bars for guests to relax in of an evening, there’s still a good choice of bars and nightclubs for those looking to let their hair down. Katiolo Night Club – For a distinctly Creole vibe, head over to Anse Faure, just past the airport, for an unforgettable night under the stars. This open-air nightclub, with its tropical décor, attracts a mixed crowd of party goers and plays everything from reggae, to rock, to techno, with a few popular oldies mixed in for fun. One of Mahe's first ever nightclubs, they’re open Wednesday, Friday and Saturday (no credit cards). Lovenut Nightclub – One of Mahe’s most popular nightspots located in the heart of Victoria. Their experienced DJ’s will keep you dancing till the early hours playing all the latest hits in this fully air-conditioned nightclub. Situated next to the central taxi stand there’s never a probably getting home before sunrise. Tequila Boom – Boasting a start-of-the-art sound & lighting system, this Bel Ombre nightclub attracts the finest crowds around, making it one of Mahe's premier venues. Playing some of the hottest beats on the island, they’re famed for their theme nights and feature both local and foreign DJ’s. Friday nights are best. Level 3 Bar – Friday nights at this busy Victoria bar is the place to be for a pre-party drink at reasonable prices. Located in the Docklands building it’s a great place to mix with locals, whilst relaxing to some groovy tunes, before heading on to one of Mahe's nightclubs. Upgrade 9T Club – New to the Mahe nightlife scene, and located in the same building as Lovenut, this lively club is a great place to head to for a fix of hip-hop, reggae and R & B, along with all the latest international hits.